Thank you for planting the seed that resulted in this website. May your THANKSGIVING be full of Blessings, Hope, and Love. This site is dedicated to remaining neutral on politically charged events surrounding Memorials and Monuments. The site is strictly designed to be informative and used for historical purposes and research. It is also designed to allow people an opportunity to discover just how many Memorials and Monuments there are in the US that honor the Fallen - for well-known wars as well as wars and events, some of which people may not be aware. No money from any organization is accepted (or will be accepted) and the site is strictly funded, designed, and researched by the owner of the site - ME. ​CHALLENGE - I want to challenge every city, town, county/parish in the US to post pictures of the Memorials, Monuments, Markers, and Museums in their area on their websites. If you accept the challenge, let me know via the contact page and I will post your website on your designated state's page on this site. Please click on subject below to advance to that section on this page. I always honor and remember my dad, especially on February 23, who was a survivor of the sinking of the American Steam Merchant ship, The Hastings in 1943. The ship was torpedoed and sunk on February 23, 1943 by a German U-boat - U 186. There were 10 officers, 31 crew members, 20 armed guards, and one passenger. The ship sank after 7 minutes. One officer and eight crewmen were killed. The survivors were picked up about twenty minutes later by the HMCS Chilliwack. ​The picture just to the right is of my dad, who is standing on the left side of the picture, with one of his brothers. All of my dad's brothers who reached adulthood served in the Navy, Air Force, and Merchant Marines. 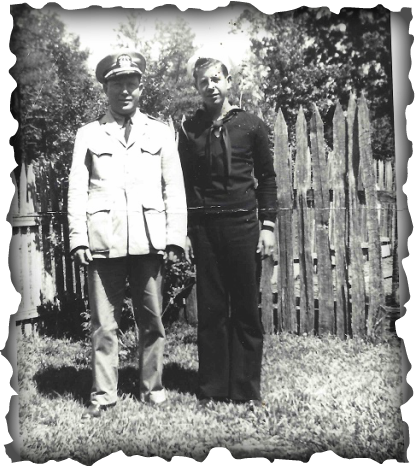 My dad first served in the Navy and then many years later, served in the Merchant Marines. He died November 28, 1978. ​P.S. 31 years later, to the day, as my dad walked me down the isle to be married, the first time, he told me that this was the day he lost two precious things - his ship and me. Added Note: 74 years later, to the day, my brother died. February 23, 2017. May you finally find solace and peace. ​This site dedicated to the men and women who died for our country and to the men and women who have served or continue to serve our Nation. A Profound THANK YOU to the many people who have helped, and continue to help, ensure that information on this site is accurate. The kindness of strangers is unbelievable and strengthens the commitment to remember and honor those who served and continue to serve our nation. WEST POINT CITY, UTAH City currently in the process of fundraising to complete their Memorial. Please visit http://www.westpointcity.org/military-memorial.htm to obtain additional information or to consider making a donation. Cenotaph - a sepulchral monument erected in memory of a deceased person whose body is buried elsewhere. Doughboys - Nickname given to the American Expeditionary Force that took part in the later years of World War I. Term replaced with GI. Dulce et Decorum est pro Patria Mori - It Is Sweet and Right To Die For Your Country. "Dum tacet clamat" - Latin phrase found on many Woodman of the World Memorials, means "Though silent, he speaks". Non Solum Armis - Latin for "Not by Arms Alone." Pro Patria, as listed with some Memorials is Latin meaning "For One's Country." Per Ardua Ad Astra - as listed with some Memorials is Latin meaning "Through adversity to the stars." Redoubt - A small enclosed work used to fortify hilltops, passes, etc. Black Hawk War - May-August 1832 (Illinois/Michigan/Wisconsin Territory) "The Black Hawk War, or Black Hawk's War, from 1865 to 1872, is the name of the estimated 150 battles, skirmishes, raids, and military engagements between Mormons and other settlers in Sanpete County, Sevier County and other parts of central and southern Utah, and members of 16 Ute, Paiute, Apache and Navajo tribes, led by a local Ute war chief, Antonga Black Hawk. The conflict resulted in the abandonment of some settlements and postponed Mormon expansion in the region." https://en.wikipedia.org/wiki/Black_Hawk_War_(1865%E2%80%9372) The years 1865 to 1867 were by far the most intense of the conflict, though intermittent conflict occurred until around 200 federal troops intervened in 1872. The Philippine–American War (Insurrection) 1899-1902 (Spanish: Guerra Filipino-Estadounidense) (Filipino: Digmaang Pilipino-Amerikano) (1899–1902) was an armed conflict between the First Philippine Republic (Spanish: República Filipina) and the United States.The conflict arose when First Philippine Republic objected to the terms of the Treaty of Paris under which the United States took possession of the Philippines from Spain ending the Spanish–American War. The war was a continuation of thePhilippine struggle for independence that began in 1896 with the Philippine Revolution. benefit called Aid and Attendance (A&A). ​ARE YOU SEEKING A MEMORIAL OR A PLAQUE OF A LOVED ONE? PLEASE CONTACT ME AND I WILL POST THE INFORMATION TO SEE IF ANYONE MIGHT BE AWARE OF THE LOCATION. Please go to the Contact Page on this site. Be sure to include your email so I can contact you for more specific information if needed.